Our weather has been incredibly and ridiculously cold recently (although it seems like months) — a seemingly endless string of days of bone-chilling temperatures. This type of weather makes me crave comfort-type food — something warm and filling. In my opinion casseroles are the quintessential all-American belly-warming one-pan comfort food. Hearty, nourishing, and simple to make, they can make nights a little easier by keeping dinner contained to just one pan. No dishes to wash and heat of stove and oven to warm home naturally. Kinda like kill-2-birds-with-one-stone. 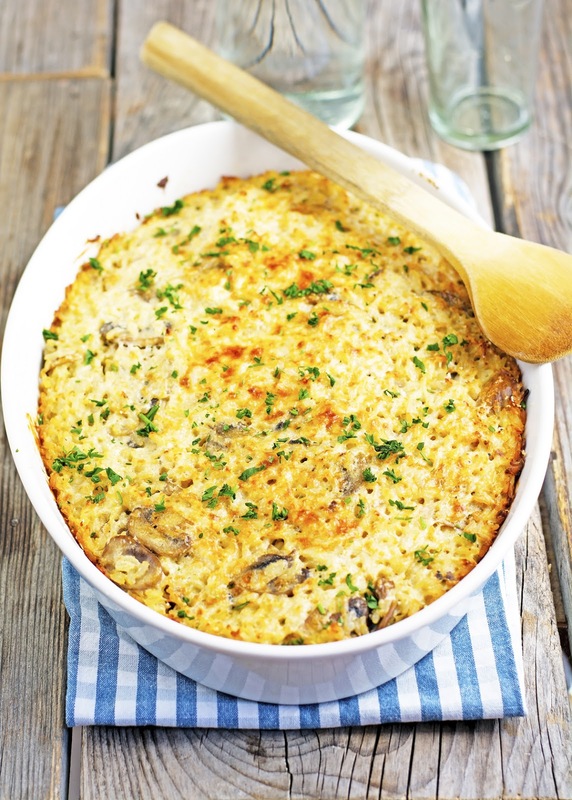 Enters this scrumptious Rice and Mushroom Casserole. I’ve been making this recipe for years. It’s a breeze to prepare, delicious, and never fails to please. I’ve gotten so many rave reviews that it’s become a standard when I’m asked to bring a side to a potluck. I like to make it with brown rice but it works equally well with any other kind of rice. 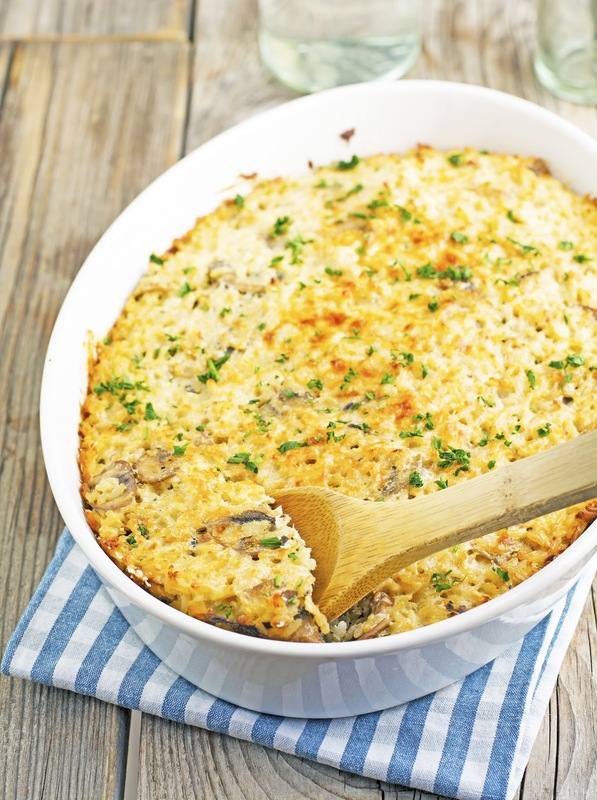 In fact, it’s a great casserole to make when you have leftover steamed rice. Just sauté some mushrooms, onions, and garlic. Mix with rice, eggs, cottage cheese, and sour cream. Sprinkle with grated Parmesan cheese and let the oven do the rest. It seriously could not be easier to throw together. All in all this rice casserole is BOSS! 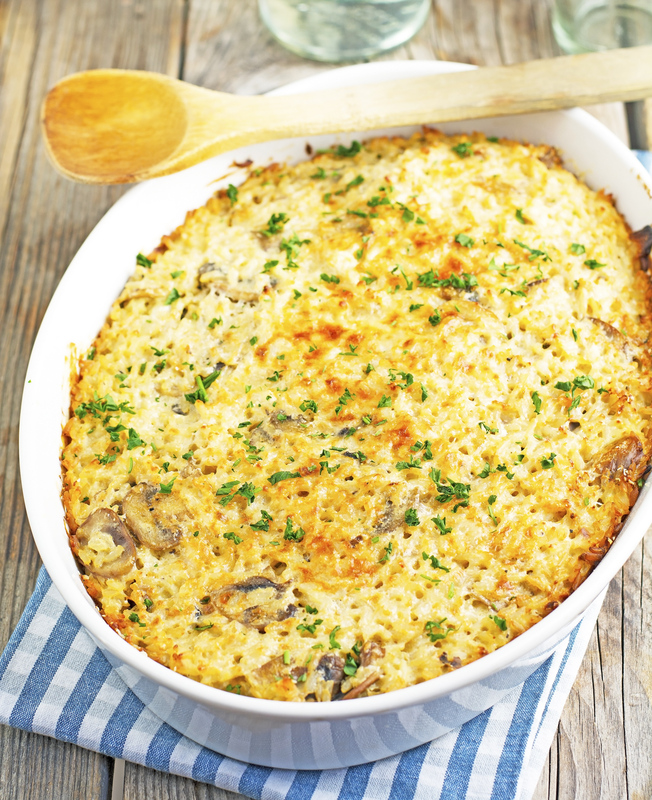 Easy Rice and Mushroom Casserole Print this recipe! Preheat oven to 350°F (175°C) and place a rack in the middle. Lightly grease a 3 quart baking dish and set aside. Heat 1 tablespoon of olive oil in a large skillet over medium-high heat. Add mushrooms, a couple of pinches of salt, and sauté until the mushrooms have released some of their liquid and start to brown. Add onions and cook for further 5 minutes, stirring every now and then. Stir in the garlic and cook for 1 further minute. Remove from the heat, add cooked rice, ¼ cup of Parmesan cheese, and stir until combined. Set aside. In a large bowl whisk eggs, ricotta cheese, yogurt, and salt. Add rice mixture and stir until well combined. Turn out into the prepared baking dish and flatten out using a spatula. Sprinkle remaining Parmesan cheese and cover with foil. Bake for 30 minutes, then remove the foil and bake for further 20 to 25 minutes, until golden. One serving yields 239 calories, 8 grams of fat, 29 grams of carbs, and 13 grams of protein.